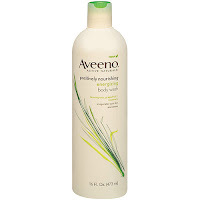 Hot Ink: Aveeno Body Wash: Energize Me So I Don't Feel Like Murdering Everyone At Work, Please. Aveeno Body Wash: Energize Me So I Don't Feel Like Murdering Everyone At Work, Please. It is the middle of winter, I have no vacation time left, and there is no winter sojourn down to Mexico in my future. My patience with everything and everyone is at an end, and it's a virtual Herculean Feat to get myself out of bed in the morning to go to work. Generally, I need SOMETHING new to motivate me, or just give me that little boost in the morning that isn't a ninth cup of coffee or meth-amphetamines. And so I turned to Aveeno for some help. I picked up the Energizing Body Wash with lemongrass, rosemary, and mint at Safeway about three weeks ago. I paid 7.99$ for a 16 oz bottle, a bit on the more expensive side for body washes. You guys, it foamed up so nicely, you don't have to use a bunch of it. The smell is heavenly. The mint really perks you up in the morning, and not only is it energizing, it kind of clears your head. I'm not a big believer in aromatherapy as an institution, but the scent of this body wash really is fresh and made me feel more awake/aware than some of the other scents I've used. This review is going to be a short one. I've ripped on Aveeno in the past (here) for having just terrible products, but they really got it right with this body wash. I mean, I have nothing BAD to say. Do you know how rare of an event this is?? I feel like there should be some sort of celebration... But instead I'll just give it a resounding 100% review! 8/8 Tentacles it is! Seriously, go and buy some.